From the end of the second century C.E., Judaism enforced a religious norm requiring any Jewish father to educate his children. We present evidence supporting our thesis that this exogenous change in the religious and social norm had a major influence on Jewish economic and demographic history. First, the high individual and community cost of educating children in subsistence farming economies (2nd to 7th centuries) prompted voluntary conversions, which account for a large share of the reduction in the size of the Jewish population from about 4.5 million to 1.2 million. Second, the Jewish farmers who invested in education, gained the comparative advantage and incentive to enter skilled occupations during the vast urbanization in the newly developed Muslim Empire (7th and 8th centuries) and they actually did select themselves into these occupations. Third, as merchants the Jews invested even more in education–a pre-condition for the extensive mailing network and common court system that endowed them with trading skills demanded all over the world. Fourth, the Jews generated a voluntary diaspora by migrating within the Muslim Empire, and later to western Europe where they were invited to settle as high skill intermediaries by local rulers. By 1200, the Jews were living in hundreds of towns from England and Spain in the West to China and India in the East. Fifth, the majority of world Jewry (about one million) lived in the Near East when the Mongol invasions in the 1250s brought this region back to a subsistence farming economy in which many Jews found it difficult to enforce the religious norm regarding education, and hence, voluntarily converted, exactly as it had happened centuries earlier. Jewish networks are the far-reaching transterritorial and transcultural channels of communication between Jews and Jewries. They formed as a result of the dispersal of Jewish society over great distances starting in antiquity and ran along the lines of Jewish congregational organisations, specific religious and doctrinal practices, and the commercial networks of Jewish merchants. Life in the Jewish diaspora and the local juridical regulations regarding the Jews constantly influenced and shaped Jewish networks in the period from the middle of the 15th until the 20th century………..Jews and Jewries felt connected and expressed solidarity beyond the borders of rulers and states. At the same time, this network of communication was influenced by the dispersal of the Jews over far distances which stretched from the Middle East to Europe. News could be conveyed and exchanged swiftly via the Jewish congregations, and the high level of mobility allowed the principle characters to travel quickly to the main centres – to the Egyptian and Ottoman courts as well as the European chancelleries and courts. …....................In the Middle Ages, the recognition of a single political authority in the Islamic world together with a religious doctrinal authority presiding over multiple congregations promoted the development of long-term connections between individual congregations. Until the 13th century, the Exilarchs (Aramaic resh galuta, “head of the diaspora”) were recognized as the highest secular Jewish authorities, which were closely connected to the leaders of influential Babylonian Talmud academies in Sura and Pumbedita until the 11th century. Together they stood in the centre of a communication network organised according to the principles of religious law. Within this context they were able to make and enforce religious as well as criminal and civil legal decisions with constant reference to the Jewish religion and sacred texts. In the Ottoman Empire this system of inner-Jewish authority was sustained by recognition from outside the Jewish community: the Hacham Bashi (Hebrew/Turkish, “chief rabbi”) of Constantinople was not only recognized by the congregations and rabbis of the province, but also by the Ottoman rulers as the highest Jewish authority. Judaic maritime history begins with the association of the Judahites with the Kinanu, as the so-dubbed "Phoenicians" called themselves. One of many evidences of Judahite exports with the sea-faring Canaanites of Tyre and Sidon, is the appearance of the Judahite royal stamp lmlk ("of the king") on the handles of wine jars in Canaanite cargos and in stock in Carthage. The Carthaginians likewise identified themselves not as a "Punic" people, but as Kinanu. The lmlk stamp is unquestionably Judahite, It is an abbreviated form of l'melekh, Hebrew for "of the King, " i.e., "a product of the King of Judah." They first appeared in the eighth century B.C.E. The Canaanites disappeared from maritime activity after the Romans defeated the Carthaginians and conquered the Levant. But the Jews continued as a significant factor in Mediterranean trade. Philo records that one of the four main occupations of the Jews of Alexandria was maritime activity in all its forms. The church father Origen (185-254 C.E. )born in Alexandria, bore witness to the fact that not only did Jewish carpenters, masons, and other workers of Alexandria cease work in observance of the Sabbath, but Jewish sailors likewise would heave to their vessels on that Holy Day. The Jewish sailors of Alexandria (navicularii) were organized into a corporation, one of the few Jewish guilds organized according to Roman law, When the church began to impose its heavy hand upon artisans associations, the maritime workers and the glassmakers were among the few exempted from conversion to Christianity. Jews were not only sailors, longshoremen, and captains of vessels, but also shipowners and the financiers of commercial voyages This is confirmed by Synesius (c. 375-413 C.E. ), Bishop of Ptolemais, who reported that on his voyage out of Alexandria, the captain and more than half of the crew were Jews. During the Roman occupation of Egypt Alexandrian Jewish entrepreneurs became deeply involved in the burgeon-ing sea trade with India. Ships carried merchandise up the Nile to be off loaded at and transported across the desert to Egyptian Red Sea ports, then laded onto ships sailing down the Red Sea, the Gulf of Aden and across the Indian Ocean. The Romans were not the traders traveling the routes but the overlords who derived a healthy income from the activity of the adventurous entrepreneurs. The Romans collected customs duties at military camps established to "protect" caravans along the African route sometimes amounting to as much as 25% of the value of the goods. An inscription of 90 C.E. at Coptos, Egypt, for example, reveals that " Passes had to be purchased by travelers for themselves, their pack animals and vehicles. Rates varied. Prostitutes using the roads to ply their trade at the ports or in the hydreumata, mines, and quarries in the Eastern Desert paid exceptionally high rates." The trail of Jewish sea-faring traders of the Roman period leads us as far as the southwest coast of India where Jews are said to have disembarked in the year 72 C.E. at Cranganore, an ancient seaport north of Cochin. The Jews adopted the local tongue, Malayalam, except for services, which continued to be conducted in Hebrew and Aramaic. The Cochin Jews were mainly spice traders, and the few Jewish families who are left still carry on a trade in cardamon, pepper, ginger, turmeric and other spices, just as they did in the early days of the Common Era. The Cochin Jews were carrying on an already ancient Jewish activity. Jewish traders had long since penetrated into India by land routes radiating out from their enclaves in Babylonia. From the eighth century B.C.E., when the Assyrian ruler Tiglath-Pileser deported 13,150 Israelites to Persia (according to the conqueror himself), to modern times, Jews have been at the forefront of international trade. The subsequent Babylonian exile added many thousands of Judahite families to the Persian/Babylonian milieu. Persia became the pivotal point from which trade between the eastern and the western worlds evolved. The Jews were the common denominator between those worlds. Jewish bankers made finance capital a factor of Persian industrial development and initiated a system of credit that Jewish traders wove into the world economy. The surviving records of two Jewish banking families are among the most revealing documents of the Persian period. They supplied the credit and capital for the expanding economy of the region. Previously, until the seventh century B.C.E., credit was available in Persia mainly on a local basis as temple loans to dependents, to be repaid in kind or equivalent, or as advances of grains or other food-stuffs from landlords to their peasant tenants in off season, to be repaid at harvest time. Such loans were generally interest-free, albeit a penalty amounting to as much as twenty-five per cent was imposed if payment was not made when due. By the mid-seventh century B.C.E., soon after the deportation of the Israelites to the area, financiers appeared who instituted a reformed system of credit whereby interest-bearing capital was offered for private enterprise and for governmental purposes. Most important among the new institutions engaged in such enterprise were the Jewish banking houses of "Murashu and Sons," and of "Egibi and Sons." They expanded the scope of credit from agrarian assistance to the energizing of industry and commerce. The family name of the other banking house vital to the economy of the area, Egibi, is an Akkadian translitera-tion of Jacob. A trove of the records of the family was fortuitously recovered because its inscriptions were incised upon clay tablets that were baked in a conflagration. The family's misfortune served to enrich the historical record. It is clear that although the Egibi and Murashu families were wealthy Jews, and while other Jews did well at court and in the service of the hierarchy, most Jews were busy at agriculture, crafts, and various enterprises. There are a number of references to Jewish engineers who earned their living as irrigation experts. All fourteen canal managers known to us by name through these documents were Jews. They were responsible administrators who exercised a technical trade central to the economy of the region.9 Some Jews participated in the military establishment. Thus, the son of a feudatory, Gadalyaw Gedaliah, "volun-teered to serve as a mounted and cuirassed archer in place of a son of Murashu. This Gedaliah is the earliest known predecessor of medieval mailclad and mounted knights. The activity of the Egibi entrepreneurs in Susa, gateway to India, presages the expansion of trade along the land and sea routes to India and China. The Jews were concentrated in the fertile canal-laced heart of Babylonia between the Tigris and Euphrates rivers. This region, and in particular the Jewish enclaves within the region, formed the hub of a network of trade routes that fanned out across Asia to the East and West. Jewish merchants and artisans established colonies at strategic points along those routes. Linen fabrics (Byssus), produced in the Holy Land by Jews, were likewise vital trade goods along the route to the East. The Chinese fancied linens as much as westerners fancied silks. Linens were therefore as marketable in China as silks were in the West. 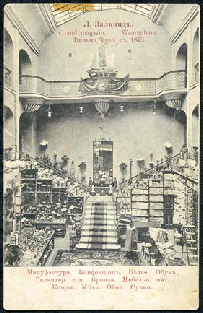 The Chinese, in turn, had unique products of great trade value in the Near East and West. Silk, cinnamon, cassia (the bark from which a form of cinnamon is produced), jade, camphor, and a variety of other Chinese products were valuable products taken in exchange for exotic beads, imitation precious stones, and linen fabrics. Silk textiles, as is well known, was anciently a major part of trade with China. Silk was not altogether unknown in the Near East before the route to the heart of China was secured. Silk produced from wild Asia Minor silkworms was used among Near Eastern civilizations of the Hellenic period. Sericulture, however, was uniquely a Chinese industry. The process of raising silkworms, reeling off filaments hundreds of meters long from their cocoons, and weaving them into beautiful, remarkably strong and stable fabrics dates back to the beginning of Chinese civilization. A silk fabric found in Zhejiang Province dates back to the astoundingly early date of 2700 B.C.E. Many Mishnah narratives bear on the trade activities of the Jewish sages. While that vast repository of Jewish tradition and law does not address economic matters as such, the anecdotes cited to point up ethical or legal questions incorporate information that cast light on such matters. For example, we read about the refusal of Beth Shean Jews to leave for Sidon on Saturday to conduct business. Sidon was a port through which eastern imports and locally-produced products were exported. Other Mishnaic narratives bear directly on the involvement of Jews in international trade. The great halachic sage, Rabbi Chiyya bar Abba, is among those mentioned in the Mishnah who are involved in shipping merchandise to and from the East. R' Chiyya is stated to have dealt specifically with products made of glass, silk, and flax, the three basic goods of East-West trade. It is related that he traveled widely in trading in these indicative products. R 'Chiyya had followed his mentor, the great Rabbi Judah Ha-Nasi ("the Prince," 135-219 C.E.) into Palestine from Babylonia. It was a traumatic time. The suppression of the Jews after the crushing of the second Jewish revolt and the destruction of the center of Judaic national culture in Jerusalem created a hiatus that Rabbi Ha-Nasi filled. He became the principal architect of the Mishnah. Judah Ha-Nasi first resided in Beth Shearim, the glassmaking heart of the Galilee, and then to Beth Shean, the center of linen manufacture. R'Chiyya's business also took him to Beth Shean, and to Laodicea (another Jewish weaving center), and into Nabatea. There are references with his dealings in spikenard [mentioned above], a spice from the Himalayas whose import was controlled by the Nabatean Arabs. Thus the Mishnah reflects the involvement of Jews like Rabbi H-Nasi in the major elements that compose the East-West trade. Augustus, the first Roman emperor is said to have commissioned "the original travel guide from Isadore of Charax, who obliged by writing The Parthian Stations. The Jewish traders of the Persian period were finally exemplified by the Rhadanites, whose name probably stemmed from the district of Radhan near Baghdad. The Rhadanites were not mere adventurers. They were Talmudic students and the religious, cultural and social liaison between the world-wide-spread Jewish communities. They were entrusted with the collection of communal donations for delivery to the Geonim of Palestine and Babylonia, halachic scholars who headed great centers of learning to which all Jews aspired to send their sons. The Rhadanites brought she'ltot, queries to the sages on law, ritual, and textual exegesis. They returned with teshuvot, the responsa. These mercantile messengers created the first world-wide credit system. They became the conduits of credit through which many nations conducted business through time and space. "Letters of Credit" issued on one continent would be surely and securely honored months later They were worldly-wise couriers who had entree into royal courts and were commissioned by kings to carry out royal diplomatic missions. The Rhadanites set the standard for Jewish international traders everywhere. When Charlemagne sent an embassy in 797 to the Caliph Harun el-Rashid, the Muslim Caliph of Baghdad, a Jew named Isaac served as interpreter; of all the principals among the envoys, Isaac alone survived the trip home, bringing with him to Charlemagne's court a present from the Caliph- an elephant, until then unseen in Europe. Both Judaic legends and local lore relating to the Jews devolve upon central Asia, materializing substance out of the dimly apparent mists of the past. Many Jews spread out along the silk route from the Crimea. The ancient Jewish community on that peninsula had split into two rival factions, the fundamentalist Karaites, and those who followed rabbinnic expansions on the Oral Law. Many of the rabbinate Jews moved to Khiva, where 8000 families formed a congregation, and similar sizable groups gathered in Bukhara, Samarkand, and Tashkent, central along the Silk Trade Route. Bukhara is reputed by local legend to be the Biblical Habor to which the ten tribes of Israel were exiled. Until the recent Aliyah to Israel, Uzbekistan harbored a population of 103,000 Jews whose records document their ancestry back to before the fifth century. Fabulous Samarkand was the hub of this ancient community. By the twelfth century a Jewish population of 50,000 headed by Obadiah carried on a flourishing existence in Samarkand alone. Impelled by traumatic experiences under Christian, Byzantine and Islamic regimes, Jews filtered out along the Asian byways that offered freedom from tyranny, freedom to practice their religion and where they were welcome to work and trade. Such a community settled in the capital of ancient China, Kaifeng. A community of 3000 Jews continued to enjoy Chinese hospitality well into the twentieth century. Jewish traveler/traders brought knowledge and skills to the West. Thus, Jewish traders in India dealt in the India decimal system (with the critical use of zero). They translated Indian mathematics into Arabic and introduced the system to Islamic North Africa, thereafter to become known as the "Arabic number system." It was so dubbed in the West not because the Arabs had invented it, but because the Europeans obtained it from the Arabs! The world has yet to acknowledge the huge debt owed to the intrepid traveler/traders of the Persian period. On January 30, 1939 Adolf Hitler addressed a historical speech, in which he announced publicly for the first time his intention to exterminate the entire Jewish people. In his address he mentioned several times “the world Jewish capital” as the source of all humanity’s evil. Many researchers asserted that Hitler’s pathological hatred of the chosen people has derived from an imaginary paranoia from the allegedly economic magnitude of the Jews, who were in fact were a weak, scattered people without any political or sovereign rights. A thousand years before Hitler projected his mental disturbances upon the Jews, there was an elite guild of Jewish merchants who held key positions and actually ruled the world’s economy; they spoke dozens of languages and had a worldwide trade network; determined to enhance their profit, they would go on any daring mission and travel any distance – those were the Radhanites. Geo political circumstances in the 9th and 10th centuries gave the Radhanites a chance to head international economic elite. Following the expansion of the Abbasid Caliphate across Arab lands, the world was split: the Christian empire of Francia ruled the North West, whereas the Islamic empire ruled the south. Historian of the orient, Eliahu Ashtor, explained in a nut shell that they were “two hostile separated worlds”. The insulation and the hostility between the two theocracies generated a critical change in commercial relations. Up until then, merchants could easily travel from the far east to the near east and Europe, then proceed to Spain and the Maghreb area. But the frequent wars in the Middle East disrupted the relations and trade routes and led in some cases to complete shutdown of the trade between the Islamic east and the Christian west. This was the first harbinger of the rise of the Radhanite merchants, who spotted a business opportunity and were determined to use it. Ashtor writes: following the blocking of the Mediterranean sea for Christian traders, the Radhanite’s could take over. They could easily travel to and fro the two empires because they did not officially belong to neither of them; therefore they made perfect natural mediators. Historian Elinoar Bareket adds that at that period the Radhanites were neutral traders but also messengers who brought lots of income into many states, therefore had privileges from the French Carolingian dynasty and as well as from Muslim rulers. It appears that Jews thought of neutrality ages before the Swiss thought they invented it. Where did the Radhanites come from and how they entered history? There are two explanations. Some historians claim that they came from Western Europe in the Rhine estuary, and that their name suggests Persian origin, meaning “way” or “path”. Others say that their origin is an ancient region of Radhan in modern days southern Iraq. The first to ever record the story of the Radhanites was the Arab geographer Ibn Khordadbeh, who left a detailed description of their journeys in China, India, Persia, Francia and then in Spain and Morocco, back through the Maghreb lands and Egypt towards the Red Sea, and back to the east. They exported rare silk, sable and mongoose furs, all sorts of leather and pricey swords, which the people of the east admired in particular. On the opposite route they brought luxuries for the western rich and famous, such as nobles, kings and church seniors: exotic fruits, furs, corals, spices, healing ointments, and musk perfume, extracted from a deer’s glands. These long journeys were dangerous and costly, and required means, which only the Radhanites had as they were very wealthy. They were in fact a small exclusive guild with a firm financial safety net. One famous periodic story tells about a Radhanite merchant called Isaac, who served as an interpreter in a delegation sent by Charles the Great to the Abbasid Caliph Harun al-Rashid, whose legendary character is the protagonist of the famous anthology “Arabian Nights”. As the delegation arrived at Baghdad, the Caliph held a festive reception and offered Charles the Great a rare present that was never seen in Francia, to express his respect – an enormous white elephant called Abu Abas. Isaac was ordered to take care of the elephant during the long trip back to the west. Before they took off he received specific instructions as to how to handle the rare beast and during the journey he was emotionally attached to the huge white good tempered animal. As they entered the doorway of the Aachen palace, the elephant attracted exciting responses; thousands of peasants heard about the giant beast and how it ate from his caretaker’s hand, and they came from far away to see the wonder. The Radhanites not only traded in prestigious goods and set on diplomatic missions; they also traded in very profitable commodities, yet not as humane, such as slaves. Since in Francia is was forbidden for Jews to buy or sell Christian slaves, they traded in white pagan slaves from Slavic lands, that had high demand among the east and among the caliphs in Cordoba who just could resist them. Female white slaves were also much desired. In Spain they were even taught how to sing and play and given certain amount of education so that they can entertain their owners. As a nation whose foundation story is about breaking free from slavery, it is appalling to picture a Jewish slave trader taking chained slaves to the fair, where they are going to be brutally castrated for money. On the other hand, the traders in question were a very small group, who certainly did not represent the entire Jewish people. But let us keep in mind, that under certain social conditions, generalizations result in paranoia, sometimes strong enough to last for a thousand years, and plant the seed of genocide in the mind of a psychopath wearing a mustache, not far from the palace where Isaac fed his pet, Abu Abas, the white elephant. Commercial activity was the mainstay of Jewish economic life in Eastern Europe from the medieval period until the mid-twentieth century. However, its significance went beyond the incomes that it brought to Jewish society and helped support not only individuals and families but also the communal infrastructure. For many centuries, non-Jewish authorities viewed Jews’ success in the field of trade as the very raison d’être for Jewish settlement in Eastern Europe. The support that trade brought Jews allowed them to overcome their neighbors’ attempts to exclude them from urban life. Trade was thus a political factor in Jewish social development. In addition, Jewish trading networks, important for economic success, helped strengthen ties between different centers and so contributed to the development of transnational elements in East European Jewish culture. The vitality of Jewish trade over the centuries is best explained as the result of a number of historical factors. These include Jews’ familiarity with monetary transactions in the Middle Ages when local merchants were still inexperienced; Jews’ economic flexibility (born of their exclusion from established economic institutions); the relative weakness of the non-Jewish urban population; and the policy of turning the economic services Jews gave to non-Jewish authorities into political support. In addition, the widespread strategy of preferring a large turnover with small profit margins to a small turnover with large margins as well as their success in creating and exploiting local, regional, and international trading networks proved influential in giving Jews an edge over their competitors. In later centuries, the very extent of the Jews’ penetration of East European markets gave their economic activity fundamental importance. The first information about Jewish merchants in Eastern Europe dates from about the tenth century. In this period, Jews took part in the slave trade between Central Asia, Khazaria, Byzantium, and Western Europe (in particular the Iberian Peninsula). Important stopping points on the trade routes included Prague, Kraków, and Kiev, towns in which Jewish colonies developed. During the twelfth century, Jews were excluded from this trade, due in part to church opposition to their dealing in Christian slaves. From the thirteenth century, additional Jews settled in Polish cities as part of German colonization. Though their major occupation at that time was moneylending, which provided the economic basis for, among other things, urban mercantile activity, they were also active in long-range trade. As Polish markets developed in such towns as Poznań, Gniezno, Lublin, Lwów, Brześć, and Warsaw, Jewish merchants dealt in the import–export trade. Among other goods, Jews exported skins, furs, wax, and cloth to Central and Western Europe, while metal products and linens were imported to Poland. Magdeburg Law, which formed the basis for much of East European urban life in this period, largely excluded Jews from local and retail trade, domains viewed as the monopoly of the istian burghers. This situation changed during the sixteenth century. As the Jewish population—now largely concentrated in Poland–Lithuania—expanded, more Jews engaged in trade. Inflationary pressures in the sixteenth and early seventeenth centuries rendered Jews’ traditional money-lending activities unprofitable. An increasing number of Jews thus entered first wholesale trade (enabling them to avoid direct clashes with urban authorities) and then retail trade outside the municipal guilds. This brought them not only into conflict with the burghers, but also into contact with the rising nobility, who were interested in evading the urban monopolies that fixed prices disadvantageous to them. These economic contacts grew in significance as the authority of the monarchy declined and the nobility became more powerful. With the backing of the nobility, Jewish merchants were better able to break into urban markets. Those Jews who acted directly as business agents for noblemen were also able to extend the latter’s exemption from taxes and customs duties to cover their own goods as well. The urban fairs, at which all monopolistic restrictions were lifted, attracted many Jewish merchants, who became highly mobile and traveled from town to town. As a result, more women were involved in trade, keeping shop while their husbands traveled or helping make sales in the marketplace. The municipal authorities remained hostile to Jewish trade, attempting to force Jews to enter into restrictive agreements (pacta) with them. This remained a relatively insignificant phenomenon until the end of the eighteenth century. Though Sejm (parliamentary) legislation tended to view Jews as one ethnic group among many engaged in trade (comparable to Italians, Scots, and Armenians), Jewish economic life was largely regulated by special community privileges granted them by governing authorities. These privileges often empowered them, giving them a status parallel to the non-Jewish burghers, particularly in the private towns owned by nobility. As a result, large numbers of Jews moved to these towns, many of which were situated in the eastern part of the Polish–Lithuanian Commonwealth. As the proportion of Jews in private towns grew, particularly in the late seventeenth and eighteenth centuries, Jews began to dominate mercantile activity. Prominent centers of Jewish trade in this period included Brody, Szkłów, Dubno, and Berdyczów in the east, as well as Leszno in Greater Poland. In many of the smaller towns during this period, all the merchants were Jewish. The Jews’ massive entry into trading activity posed a number of problems to their communal authorities. The first involved the provision of mercantile credit to Jewish merchants, a practice forbidden by the biblical injunction against taking interest on loans between Jews. This problem was solved by a group of rabbis led by Yehoshu‘a Falk ha-Kohen of Kraków in 1607. They reformulated the so-called heter ‘iska—a credit agreement in the form of a business partnership—that allowed Jews to give and receive credit from other Jews. A new form of promissory note called mamran was also devised. It acted as a bearer bond and so allowed more flexibility for the transfer of funds. Another significant problem was the large number of bankruptcies, often caused by the great fluctuations in early modern markets. In 1628, the Polish Council of Four Lands (Va‘ad Arba‘ Aratsot) issued detailed regulations for dealing with Jewish bankrupts, and the new rules seem to have brought the phenomenon within reasonable limits. Jewish women peddlers came under fire for brazen and irreligious behavior as well as for taking business away from male merchants. A distinguishing feature of Jewish trade in this period was the role it played in the burgeoning agricultural economy. Due to the development of the arenda (a form of leaseholding) system in Poland–Lithuania, Jews played a key role in marketing agricultural produce. Though they were not heavily involved in the export trade via Gdansk, they were largely responsible for the sale of grain to the local population in the form of alcohol. In the second half of the eighteenth century, this trade came under criticism, with Jews being blamed for alcoholism among the peasant population. In their roles as tavernkeepers or itinerant peddlers, Jews not only bought the peasants’ surplus grain but also sold them goods from the towns. They thus acted as a crucial link between the rural and the urban markets. This role was particularly prominent in the eastern regions of the Polish–Lithuanian Commonwealth and also developed in Hungary during the eighteenth century. The success of Jewish merchants in competing with their non-Jewish counterparts in all but the long-established royal towns, such as Kraków, Poznań, and Lwów, enabled them to take such a firm grip on the urban markets that foreigners in Poland were often under the impression that trade in Poland was entirely in Jewish hands. This was partly because even Jews whose main occupation was handwork or craft would sell their own produce. Thus, an even larger proportion of Jews were active in trade. Penetration by Jews of the markets means that it is hard to identify particular branches as especially “Jewish.” Among the most prominent branches of trade could be counted foodstuffs (including salt), beverages, furs, skins, and cloth—a commodity in which many Jewish women dealt. On the whole, however, Jews did not make up the wealthiest stratum of merchants but rather formed the secondary ranks of traders, suppliers, and distributors—from established shopkeepers to the poorest peddlers. There were also masses of indigent Jews who eked out a living by brokering small transactions between clients and merchants. Communal authorities often sharply criticized these usually poverty-stricken individuals for taking too large a percentage and ruining the market. All in all, then, despite economic competition and religious hostility, Jews became an accepted part of the Polish–Lithuanian markets, with business partnerships between Jews and non-Jews not uncommon. Though always active in international trade, Jews did not play a preeminent role until the latter part of the period. From the sixteenth century, Jewish merchants in Poland had retained business connections with the Ashkenazic heartlands of Central Europe, in particular with Breslau and Frankfurt. Jewish trading networks extended to the south and east into the Ottoman Empire, particularly into Walachia, until they were severed in the early seventeenth century. Jews also overcame trading restrictions in Gdánsk in order to gain access to Poland’s major international market (though they did not deal much in grain). Though all this activity angered many non-Jewish merchants, its economic significance was considerably less than its critics assumed. In the eighteenth century, Jewish mercantile activity in the Baltic markets of Gdansk and Königsberg intensified as a result of Jewish merchants’ role in financing the river trade in grain. The emigration southward of Jews from Poland–Lithuania led to increased trading links, particularly for importing wine from Hungary. Trade with markets in German lands also grew as a result of Jewish migration, as well as a result of the accession to the Polish throne of the Saxon Wettin dynasty. However, it was only after the death of the last Saxon king of Poland that the role of Polish–Lithuanian Jewish merchants in the great international fair of Leipzig grew exponentially. As a result of the easing of discriminatory taxation on Jews at the fair in 1772, many more Polish–Lithuanian Jewish merchants began to attend. From Poland they brought furs, skins, tallow, saltpeter, and wax, returning with finished goods, especially textiles and metal products. Jews eventually made up more than 90 percent of all the Polish–Lithuanian merchants at the fair—a sign of the importance of Jewish trade and Jewish merchants in the Polish–Lithuanian economy. Among the characteristics of Jewish trade in the period after the partitions was its great diversification. This was caused in part by the modernization, albeit slow, of East European markets and in part by the inclusion of the Jewish population in a number of different regimes. The growth of Jewish centers in New Russia, Hungary, and Romania also added to this diversification, which makes any attempt to create a single narrative history of Jewish trade difficult. Another characteristic of this period was increased intervention in Jews’ economic life by the central authorities of the states and empires in which they lived: the policy was initially one of productivization, which meant forcing Jews to leave their supposedly unproductive occupations in trade. Later in the century, the processes of urbanization, the rise of mass politics, and the consequent strengthening of the Christian burgher classes tended to increase hostility toward Jews, adding more difficulties to their economic lives. By contrast, urbanization and the modernization of mercantile activity opened up new business opportunities that Jews were well placed to exploit. In addition, since, for most of the period under question, Jews were unable to invest their money in land, profits tended to be driven back into the business. Moreover, Jews often displayed a greater degree of flexibility than their non-Jewish competitors, perhaps as a result of their centuries-old struggle to evade conservative economic institutions that aimed to exclude them from urban markets. Women played a significant role in mercantile activity, either helping out in the family business or supporting the family alone while the husband devoted himself to religious study. Nonetheless, the modernization of Jewish trade was a patchy phenomenon, with new and old forms of mercantile activity coexisting until World War I. The aspect of Jewish trade that was most heavily criticized and that the various authorities most wanted to abolish during this period was the Jews’ marketing of agricultural produce—particularly in the form of alcohol. In both Galicia (1784) and tsarist Russia (1804), this activity was banned, though in both cases the legislation proved ineffective. In fact, Jews continued in this profession throughout the nineteenth century. Even tsarist laws ordering the expulsion of Jews from villages (1804, 1853) proved ineffective, largely because Jewish merchants and traders, who continued to form the link between the urban and rural markets as they had done in previous centuries, were an irreplaceable part of the economy. In Congress Poland, a law of 1840 excluded Jews from selling alcohol as lessees of village taverns. It was the cancellation of the estate owners’ monopoly on the sale of alcohol to subjects at the end of the nineteenth century (Galicia, 1889; Russia 1898) that put this trade into terminal decline. By World War I, it had lost much of its economic significance for Jewish society. Much harder to eradicate was the Jews’ marketing of agricultural produce. Jews continued to play a major role in this field in most of Eastern Europe during the nineteenth century. This was largely due to the Jews’ continued role as mercantile agents for the noble estate owners. A major center of the Jewish trade in grain was the port city of Odessa in New Russia. Toward the end of the nineteenth century, peasant cooperatives began to be formed, particularly in Galicia, with the aim of breaking the Jews’ monopoly on this market. Success—initially at least—was limited. In the new center of Hungary, however, Jewish merchants who had come to dominate this traditional Jewish occupation, attracted by the region’s expanding agricultural economy, began to shift by the last third of the century toward industry, but one that was initially based in the processing of agricultural produce such as grain and sugar. In the cities, Jewish merchants overcame much restrictive legislation in the early decades of the nineteenth century to form the dominant urban mercantile group in most of the places in which they lived. Their success was based to a great extent on their willingness to embrace innovations, whether in the design of attractive storefronts at the beginning of the nineteenth century or in the use of shopping galleries and malls at the beginning of the twentieth. In fact, many business innovations were simply developments of earlier phenomena: for example, the nineteenth-century commercial agents and owners of trading information centers, like those that sprang up in Bucharest and Iaşi in the 1880s, were really a modern form of eighteenth-century trading brokers. The majority of Jews who were engaged in trade remained poor, surviving on minimal profit margins and scrambling to ensure sufficient turnover to provide a basic income. In this period, the gap between wealthy and poor merchants grew ever wider. The discriminatory policies and general economic stagnation of much of the Pale of Settlement and Galicia meant that fewer small Jewish traders were able to make a living as independent businessmen. Wealthier merchants, by contrast, could sometimes garner significant support from authorities to help improve their businesses. Tsarist legislation of 1859, for example, permitted wealthy Jewish merchants belonging to the First Merchant Guild to live outside the Pale of Settlement. The emancipation of Jews by the Austro-Hungarian Empire in 1867 also opened significant business opportunities for the upper strata of Jewish society. As a result of this gap, a mass of poor Jewish traders developed—often hardly differentiated from beggars—who were largely dependent on the wealthiest stratum of Jewish businessmen in order to make living. This phenomenon was particularly pronounced in the Pale of Settlement. There as elsewhere, the great Jewish merchants tended to diversify their activities, branching out from trade into finance and industry. In the second half of the nineteenth century, Jewish entrepreneurs became prominent in, among other things, textile and sugar manufacturing, developing expertise that permitted them to restructure not only the means of production, but also the means of financing and marketing their product. Thus, while some poorer Jews were able to find employment selling manufactured goods from the new industrial enterprises, this market restructuring, together with the introduction of the railways (another innovation largely pioneered by Jewish entrepreneurs), led to the decline of the traditional network of urban fairs, which had for centuries provided major markets for many Jewish merchants. Thus, the activities of great Jewish entrepreneurs, such as Izrail’ (Yisra’el) Brodskii, Jan Bloch, and Israel Poznański, could do little to alleviate the distress of the poor Jewish traders. During the nineteenth century, Jews were prominent in the international grain trade centered in Odessa and in the transit trade between Galicia and Vienna, which passed through Kraków. In tsarist Russia, the policy of tariff boundaries, aimed at preserving a positive balance of trade, encouraged many of the poorer Jewish merchants to smuggle goods across the borders in order to increase profits. This type of Jewish trade incensed the tsar, who tried to stamp it out in 1843 by ordering the expulsion of all Jews from a region within 50 versts of the borders. Though never rigorously enforced, the policy served to deepen the economic distress of impoverished Jewish merchants in the small towns of the Pale of Settlement. In the second half of the nineteenth century, a large number chose to migrate to the better economic conditions of New Russia and Congress Poland. Economic distress was also a major factor in the mass migration of Eastern European Jews to Western Europe and the United States in the decades before World War I. The terrible physical destruction and displacement of the Jewish population that occurred during World War I did much to destroy old patterns of mercantile activity. With the reestablishment of organized Jewish life in the new states of Eastern Europe following the Russian Revolution and the end of hostilities, Jews had to reconstruct their economic lives in quite different circumstances. It is possible to discern two separate types of development of Jewish mercantile activity in this region during these years: the first may be seen in the Soviet Union, the second in the new nation-states of East Central Europe established after World War I (Czechoslovakia, Poland, Hungary, Romania, and the Baltic States). Common to both cases was the pressure brought to bear by authorities in order to change Jews’ traditional economic patterns, and the hardships these policies brought to Jewish society. At the beginning of the period, commerce in one form or another was the occupation of the majority of Jews in Eastern Europe, and Jews made up a significant proportion—if not a majority—of merchants in the various regions. The Soviet Union viewed this situation as a problem because it saw commerce as a negative occupation, and sought to effect the productivizing of the Jewish population. In terms of the national economy, private commerce was to be abolished in favor of state-controlled economic activity. By the mid-1920s, private merchants and traders in the Soviet Union (including Jews) were finding it difficult to make a living, as all trade was supposed to be channeled through the state enterprises. This caused a great deal of suffering to a whole generation of Jews for whom trade, particularly in the small towns and villages, was the only source of support. Those who could—particularly the younger generation—chose to leave the small towns and head for larger cities where there were much better economic opportunities: some found productive work in the new factories being established, while many more took advantage of the possibilities that higher education opened for them, becoming proud members of the new Soviet middle class. By the end of the period, the Russian Jewish merchant was largely a thing of the past. In the new nation-states, the situation was quite different. These states viewed Jews’ predominance in trade as a problem since Jews were not regarded as belonging to the nation that the state was supposed to serve. Thus, economic policy toward Jews began to shift from the previous paradigm of trying to reform their economic activity in order to better assimilate them into the economy. In its place appeared a new program aimed at excluding Jews as far as possible from the national economy, while encouraging members of the dominant nationality to take their place. Obviously, these states did not adopt this policy in concert, although it was common to most of them. Its effects were also felt at different intensities in different states in different times: thus, in some parts of Czechoslovakia Jews were hardly affected by such a policy until the Nazi takeover in 1938, whereas in Poland and Romania Jews suffered from economic discrimination throughout the period. This discrimination could take many forms: the creation of special bureaucratic restrictions, difficulties in receiving bank loans, inequitable zoning and other local regulations, and exclusion from local merchants’ guilds could make the daily life of Jewish merchants more difficult than that of their neighbors. In Poland in 1919, the state legislated a universal Sunday Rest Law, an act that effectively meant that Jewish shopkeepers had to keep their stores closed two days a week. Though the law was never rigorously enforced, evading it involved Jewish merchants in no little trouble and could be costly in terms of bribes. With the rise of fascism in the mid-1930s, many states in the region added openly antisemitic legislation to their books. However, even before this, in some places including Lithuania and Romania during the late 1920s, observers began to note that merchants of the dominant nationality were replacing the traditional Jewish mercantile class. On the whole, however, Jews remained the leading force in the mercantile life of the states in which they lived, though their large numbers did not always reflect their wealth. With the exception of Hungary, where the most affluent stratum of Jews continued to run large trading, industrial, and financial firms, the East European Jewish merchant in this period was predominantly self-employed or ran a small business with few employees. In larger cities such as Warsaw and Budapest, masses of small Jewish merchants, who dealt with the widest possible range of goods, played a significant role in the urban economy, while in smaller towns they continued to form the crucial link between the rural and the urban economies. This period was one of widespread pauperization for the Jewish merchant in Eastern Europe. The reasons for this were not always to be found in discriminatory policies and did not affect only Jews: the loss of the Russian market following the 1917 Revolution had serious economic consequences for many of the states and severely disrupted existing Jewish trading networks. In addition, the depression of the 1930s was a terrible blow to the weak economies of all the new nation-states, causing great economic hardship to all the population (with the possible exception of the Czech lands and their Jewish population, who seem to have weathered this period relatively easily). Jewish merchants, who had to deal not only with the consequences of the depression but also with the discriminatory policies of the different states, were hit particularly hard. Their situation deteriorated sharply with the rise of fascist-inspired, chauvinist regimes in most of the states in the second half of the 1930s. The complete removal of Jews from the national economy became a major plank in governmental policy, and new laws were introduced to achieve this goal. In Poland in 1936, a range of anti-Jewish legislation was introduced, which included the outlawing of kosher slaughter. This hit the Jewish meat trade very hard indeed. The government also openly supported a boycott of Jewish businesses, promoted by Polish nationalist parties and the church in the same year. In Hungary in 1938, the first “Jewish Law” was passed, which acted as a kind of numerus clausus of Jews in commercial undertakings that employed more than 10 people. In these as well as in the chambers of commerce and industry, Jews were to be limited to 20 percent. A year later a second law was passed, reducing the proportion of Jews in some cases to just 6 percent. In 1939, the new sovereign Slovak state (a Nazi protectorate formed in what was left of Czechoslovakia after the Munich agreement) introduced a Jewish law similar to that of Hungary. Thus, by the outbreak of World War II, Jewish trade and Jewish merchants in Eastern Europe seemed to be in a downward spiral with prospect for improvement. In many respects, the initial period of the Holocaust, whether under the Soviet Union, the German occupation, or puppet regimes, constituted an intensification of the processes seen in the interwar period. The Soviets implemented a policy of productivization in the eastern part of Poland, which they occupied in 1939, while the Nazis and their allies became ever more radical in excluding Jews from the economy—and, of course, the society—of the states in which they lived. Jewish trade, which had always been an important point of contact between the Jewish and non-Jewish populations, suffered greatly. It did not disappear entirely, however. With the establishment of ghettos, Jewish trade continued—even in the conditions of scarcity and starvation that reigned there. While the leadership of some ghettos, such as Łódż, argued that Jewish interaction with the Nazis in the realm of industrial production might save at least some of the population from death, individual Jews sometimes turned to independent trade in order to survive. While poverty forced ghetto inhabitants to sell whatever they could, the most important trade was in food. Since the Nazi authorities allowed the purchase of only the most meager amount of food for the ghetto inhabitants (in the Warsaw ghetto at one time it stood at a daily ration of 184 calories), a network of smugglers and black marketeers began to work. Many of these were individuals acquiring food for themselves and their families, but a number did so for commercial reasons. In the most disadvantageous of situations, they worked out deals with suppliers outside the ghetto in order to buy food to be smuggled in. This was a most hazardous procedure for all involved, and many were caught and killed—even the Jewish women and children who were active in smuggling the food itself into the ghetto. Ghetto society was divided in its opinion of the large-scale smugglers: some viewed them as criminals trying to get wealthy at the expense of the starving masses, while others viewed them as entrepreneurs, helping to supply food when the official leadership could not. Ultimately, of course, all these efforts were in vain in face of the genocide perpetrated by the Nazis. As the Nazis were being driven out of Eastern Europe in 1944, the few remnants of Jewish society that had survived began to come together to start trying to reorganize their lives. After the end of the war, many chose to leave—particularly following waves of antisemitic attacks in 1945 and 1946. Those who stayed tried either to return to their prewar activities, such as trade, or to try their hands at productive labor in a Jewish cooperative framework, such as those organized in Poland. When the Soviet Union began to consolidate its hold over the region in the late 1940s, the policy of productivization was once again imposed on Jews, who soon ceased independent mercantile activities. Though some Jews returned to trade toward the end of the Soviet period and following its demise in 1989, this was not a significant phenomenon. Today, it would seem that the centuries-long association of Jews with trade and mercantile activity in Eastern Europe has been severed for good. In the nineteenth century, Jewish merchants created a thriving niche economy in the United States’ most important industry—cotton—positioning themselves at the forefront of expansion during the Reconstruction Era. Jewish success in the cotton industry was transformative for both Jewish communities and their development, and for the broader economic restructuring of the South. Cotton Capitalists analyzes this niche economy and reveals its origins. Michael R. Cohen argues that Jewish merchants’ status as a minority fueled their success by fostering ethnic networks of trust. Trust in the nineteenth century was the cornerstone of economic transactions, and this trust was largely fostered by ethnicity. Much as money flowed along ethnic lines between Anglo-American banks, Jewish merchants in the Gulf South used their own ethnic ties with other Jewish-owned firms in New York, as well as Jewish investors across the globe, to capitalize their businesses. They relied on these family connections to direct Northern credit and goods to the war-torn South, avoiding the constraints of the anti-Jewish prejudices which had previously denied them access to credit, allowing them to survive economic downturns. These American Jewish merchants reveal that ethnicity matters in the development of global capitalism. Ethnic minorities are and have frequently been at the forefront of entrepreneurship, finding innovative ways to expand narrow sectors of the economy. While this was certainly the case for Jews, it has also been true for other immigrant groups more broadly. The story of Jews in the American cotton trade is far more than the story of American Jewish success and integration—it is the story of the role of ethnicity in the development of global capitalism.